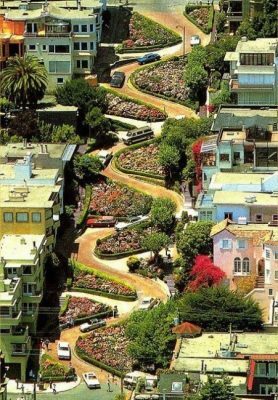 For reasons I cannot muster, I’ve been thinking about Lombard Street in San Francisco this week, the crookedest street in the world. A short block long, one-way only, down a very steep hill, eight tight hairpin turns, at a recommended maximum speed of five miles per hour. On one hand you must proceed with caution. On the other hand, the beautiful, quaint, brick-paved route is fun, challenging and a great joy to navigate. Here’s your puzzle: what do Lombard Street and your business have in common? They both require you to proceed with caution while enjoying the fun, challenging joy of navigating to your Goal! A strong metaphorical resemblance, don’t you agree? While it’s *only* January, we want to make sure you’re mastering your business, rather than it mastering you this year. Your business might feel filled with sharp turns, giving you that anxious rush in your stomach as you cascade rumble-tumble down a steep hill. You step on the brakes and go slowly, too often missing the joy the ride brings. Plus, approaching Lombard Street without a driving plan means you might not make it down the hill. You might not even get in the usual line to be one of the lucky cars to take the plummet. With a plan it’s like a great ride at Disneyland—you want to queue up and do it again. Kind of reminds me of your business. With a business plan in hand the sharp turns—though often unexpected—become manageable. The sensation of cascading down hill feels more controllable. You don’t have to step on the brakes too often. As a matter of fact, you can probably pick up speed! Month Two of 2019 kicks off shortly (like Friday). If you haven’t mapped out your plan for this year, when do you have that on your calendar to execute? If you don’t know where you want to go, you’ll get somewhere, but nowhere you want to be. Control your business. Or it will control you. Drive like you know where you’re going…because you do.